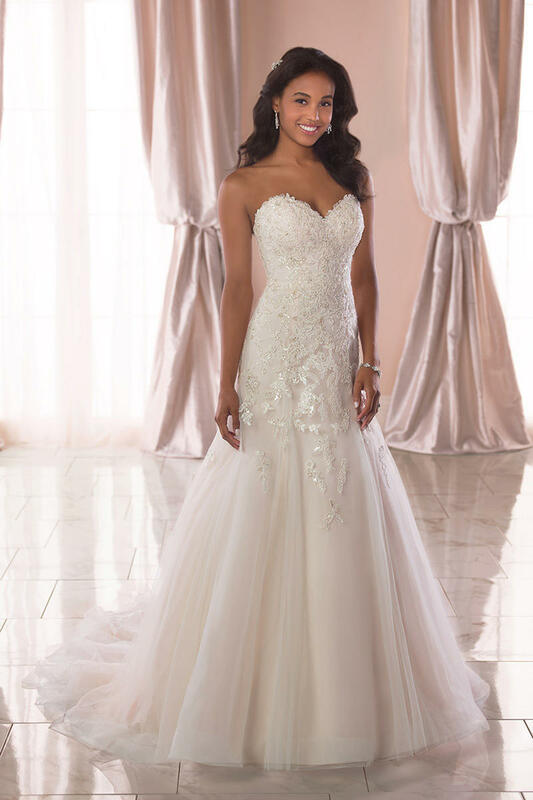 With all the makings of a classic A-line wedding dress, this gown is given a modern, sparkling update with silver beading. Designed by Stella York, this lace, tulle, and Regency Organza dress features a strapless sweetheart neckline and a gorgeous train. Luminous silver beading details the lace of the bodice, which cinches at the waist and flares out just at the hips. Traditional lace is re-embroidered for added dimension and interest. A full, frothy skirt has gorgeous lace lining the hem of the train, which complements the fabric-covered buttons. Additionally, this classic A-line comes with the option for a lace-up back and is available in plus sizes.